Claiming 4 Gold in the Decanter 2012 wine awards, amongst others; Slovenia remains 'the leading force in the region'. Home to the world's oldest grape vine, wine making in Slovenia existed long before the Romans introduced winemaking to France, Germany and Spain; since the time of the Celts and Illyrian tribes. It's no wonder then that Slovenia has such a rich wine making history and in excess of 28,000 wineries, producing upward of 80 million litres of wine annually from its 22,300 hectares of vineyards. Roughly 75% of that production is taken up with White wine. Almost all of the wine produced in Slovenia is consumed domestically; the remainder of which is exported. Quality continues to replace quantity as wine makers enhance their skills; as evident by the growing number of award winning wines making their way onto tables the world over. With twenty wine routes to follow, you are bound to find a drop or two to whet your appetite. One drop of particular note is 'Cviček'. Light red in colour; this slightly sour, yet fresh and light wine, has had a long connection to the Dolenjska area. A blend of Modra Frankinja, Žametna Črnina, Krajevina, Laški Rizling, Rumeni Plavec and Zeleni Silvanec. The steep growing terrain in Slovenia promotes manual harvesting practices over mechanical for most of Slovenia's vineyards. There are around 6,000 grape varieties recorded in the world, however at least as many remain unrecorded. The information provided is by no means exhaustive and represents only a portionate glimpse of wine-making in Slovenia. Bordering Croatia and Hungary in the east, Podravje is Slovenia's largest wine region covering some 9,650ha and is famous for its sparking wines and world class dessert wines. The wines from this region are amongst Slovenia's most prestigious, with wine being known of in this area since pre-historic times. Almost 97% of wine produced here is white wine. Officially two major areas, these are broken down into 7 smaller districts. With approximately 4,400 hectares of cultivated wine growing land and annual production of around 10million litres, this is the smallest of the wine producing regions in Slovenia. The Dolenjska area being home to Cviček; the fresh, light and slighly sour red wine. Cviček has a rich history of more than 200 years and is the wine of choice for most households in the Dolenjska area. Slightly smaller in area at 8,081ha but producing up to 30% more wine than the Podravje region, Primorje is the most developed of the three Slovenian wine regions with an annual output of over 25million litres. There is a very stong Italian influence in this area; in language, food, culture, architecture and viticulture. If you would like to book your wine tour in the Goriška Brda, Vipava valley or the Karst region, you are invited to contact the Winestronouts' team via email: info@winestronaut.com or by phone at: 0038640166042. With hot summers, little rainfall, thick autumn fog and very cold winters, the grapes in this area mature quickly, but with a low yield due to the lack of summer rainfall. The white wines from this area tend to be semi dry to dry, with Laški Rizling a moderately strong wine occupying over 50% of all vineyards. Red wine accounts for approximately 3% of overall production. Laški (Italian) Riesling, Pinot Blanc, Chardonnay, Pinot Gris, Sauvignon, Traminer, Rinski Rizling, Muskatel. Haloze is a thin strip of hills running along the banks of the Drava River for 31km. The eastern side noted for its wine making since Roman times. Vineyards tend to be located along the hilltops away from the shade of the eroded lower slopes. Most wines here are produced, bottled and store in nearby Ptuj. White wines dominate this area. Whilst it is the smallest it is arguably the best wine growing area of the Podravje region, with the highest density of ideal wine growing sites. Situated between the Mura River to the northeast and the Drava River to the southwest, the climate is more balanced due to their cooling effect. There is a long tradition of special quality wines from this area; late harvest and ice wines. This area is famous for its aromatic white wines. The majority of wines of the area are produced and stored in Vinag cellar, a 200 year old building known as the Maribor Wine Tabernacle. Covering an area of 4.9 acres in three kilometres of underground tunnels beneath Maribor it is one of the largest of its kind in Europe. It has a storage capacity of 7 million litres of wine with at least 70% of this taken up by classical storage in barrels. Stretching northwest to southeast from Gornja Radgona on the Austrian border to Ljutomer, this area is on the right bank of the Mura River. With hot summers and cold winters it has two sub areas, Radgona and Kapela. These areas differ in soil compostion and mountain ridge orientation. There is a long tradition of producing sparkling wines dating back to the early 19th century. Home to the oldest wine archive in Slovenia, housing pre-war vintages and some of the excellent whites which the area is known for. The climate is mixed with influences from Pannonia being moderated by cooler currents from the Alps. The area is hilly, however, only its southern and eastern slopes are suitable for wine growing. This area lies between two spurs of the Alps. These natural borders make the climate mostlycooler than Haloze. Compensating for less generous nature the growers have had to choose both their sites and their vines carefully. Almost 30% of all vineyards produce a special, fresh Laški Rizling. However, the true specialty of this region, which is consistently among the best in Sloveniais Modra Frankinja. Laški Rizling, Renski Rizling, Traminec, Šipon, Rumeni Muškat, Rizvanec, Beli Pinot, Modri Pinot, Sivi Pinot, Rulandec, Sauvignon, Chardonnay, Rulandec, Modri Burgendec, Modra Frankinja, Žametna Črnina, Modra Portugalka, Zlata Radgonska Penina, Radgonska Ranina, Ice Wines. Neighbouring the Dolenjska growing area, Modra Frankinja reaches its best here. The climate is gentle, avoiding the cold winds of the north with its mountainous back. Special to this area are the red, white and rose sparklng wines and tawny port. Indiginous to the area is the Rumeni Plavec white wine, used primarily for blending. The term "Dolenjska", applied in geography terms, applies to most of the Posavje growing area. Home to Dolenjsko Belo, believed to have medicinal properties and suggeted to alleviate chronic rheumatism and arrest the formation of kidney stones. It is also home to Cviček, the fresh, bitter, refreshing wine that wends its way through the veins of almost all of the locals living in the region. Since 2001 Cviček has been legally protected as a product of "traditional denomination" within Slovenia and the EU. The last few decades have seen white wines take over what was predominently a red grape growing area. Climatically mixed, the area experiences both Mediterranean and Pannonian influences. Winds bring the warm, humid air from the Adriatic. Spring arrives early, the summer is very hot and winter delivers generous amounts of snow and cold. The Goriška Brda region, Slovenia's "Tuscany", has the highest yield per hectare of medals and awards of all Slovenian wine growing areas. Bordering Italy, "brda" simply means hills; which, prone to erosion means that most vineyards are terraced. Although not in direct contact with the coast the climate is Mediterranean, with higher rainfall and moderately hot summers. Click here for an interesting article on The Goriska Brda in the Financial Times of London. "Teran" is the most characteristic wine of this region. With cold windy winters, frequent long droughts and scorching summers, the Kras climate is best described as harsh. Stretching some 24kms, the Vipava Valley stretches from Mt Nanos in the east to Novo Gorica in the west. The most noteable feature of the region is the "Bora" wind, gusting down from Mt Nanos at speeds exceeding 200km/h. Its unique location gives rise to five micro-regions and as many characteristic wines. Grapes from the Zelen and Pinela variety are used to make crisp white wine which this area specialises in. 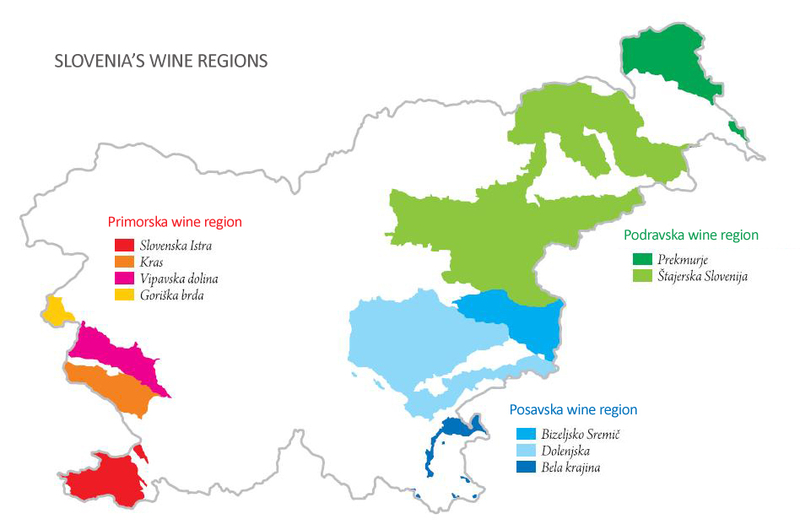 Red wines dominate this area with Refošk and Malvazija the most widely cultivated grapes. The humid coastal climate for some, encourages the need to plant grass between the rows, to lower the yeild, slow the maturation rate to increase aromas and flavours. Cabernet Sauvignon produced in the Koper area in good years is arguably the best in Slovenia.